Very little of the score Stanley Kubrick commissioned Wendy Carlos and Rachel Elkind to compose for The Shining made it into the final cut. Instead, Kubrick returned to the Eastern European modern classical music that had transformed our expectations of the sound of outer space in his earlier 2001: A Space Odyssey, namely that of György Ligeti, and in addition, perhaps even more importantly, Krzysztof Penderecki. The resulting sonic landscape of the Overlook Hotel – the 1930s popular songs of Al Bowlly soaked in reverb as they echo and refract around the hotel corridors, the rumbling whistling drones and spectral harmonics of Penderecki and Ligeti, and the few remaining snatches of Carlos’s electronics and Elkind’s ghostly layered vocals – became representative of a certain trend in recent music that critic Simon Reynolds and theorist Mark Fisher have labelled ‘hauntological’. The term, derived from Jacques Derrida’s Spectres of Marx (1993), refers to the ambiguous ontology of ghosts, an absent presence of half-buried traces, familiar fragments made strange by their post-historical (lack of) evocations. Among those artists labelled ‘hauntological’, along with Philip Jeck, The Focus Group and Ariel Pink, we find The Caretaker, a project by James ‘V/Vm’ Kirby specifically inspired by the haunted ballroom scene in Kubrick’s film. Most previous discussion surrounding sonic hauntologies have tended to focus on just two elements of The Shining‘s music: the ballroom ballads of Al Bowlly and the analogue electronics of Wendy Carlos. 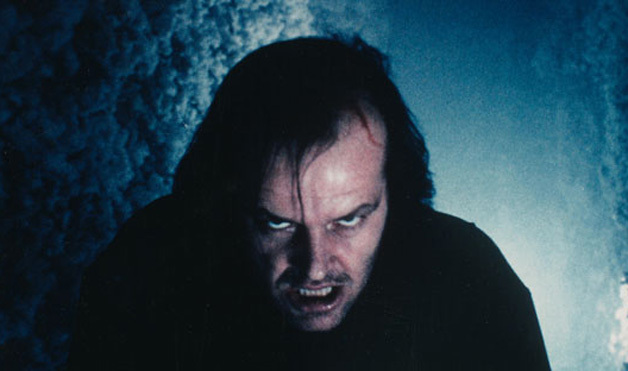 What is less often remarked upon is the use of Penderecki’s music in the film’s dénouement, when Jack Torrance is chasing his son Danny round the snow-caked maze. According to music editor Gordon Stainforth, while filming this scene Kubrick played Stravinsky’s Rite of Spring to the cast and crew through a little portable cassette player. However, there is little evidence that Kubrick ever intended this to remain in the final cut, and, though Stravinsky’s ballet score may well have given those on set the requisite sense of violet energy, it is unlikely the scene would have been so chillingly effective had this music stayed to the final cut. In fact, the final choice of music for this scene appears to be one of the few moments in the film where Kubrick directly insisted on the specific works used, rather than leaving the individual choices – out of a wide selection made previously by the director – down to Stainforth, as happened for most of the rest of the picture. The scene actually layers several different tracks of music on top of one another, all of which, however, are taken from the second half of Penderecki’s Utrenja (1969-71). The piece is scored for strings, percussion and choir, and the composer has compared the orchestral effects used to the kind of sonorities associated with electronic music. The text, taken from the Orthodox Christian liturgy, is concerned with the resurrection of Christ. One could easily make too much of the Christian symbolism in The Shining – the Faustian pact Torrance makes with the hotel when he offers his ‘good damn soul’ for a drink; the suggestion, at the end, that he may be the resurrection of a man in a photograph from 1921 who shares his face. What is significant, though, is that the action of the film ends with a piece of music – whose uncanny effects are produced by stretching the technique of ‘natural’ acoustic instruments until they sound electronic and inhuman – which reminds us that Christianity is essentially a religion of the undead rising from the grave; a religion of ghosts.